Home Politics How is the disarmament plan doing so far? How is the disarmament plan doing so far? It has been almost a month since the voluntary disarmament plan I wrote about last week was first announced by Nicolas Maduro, and finally we have an official number from Interior Minister Miguel Rodríguez Torres. 800 guns collected. That’s it. To say unimpressive would be an understatement. But the government isn’t worried and will do a special program next month. What’s the catch? It will be sort of a telethon hosted by TVes. 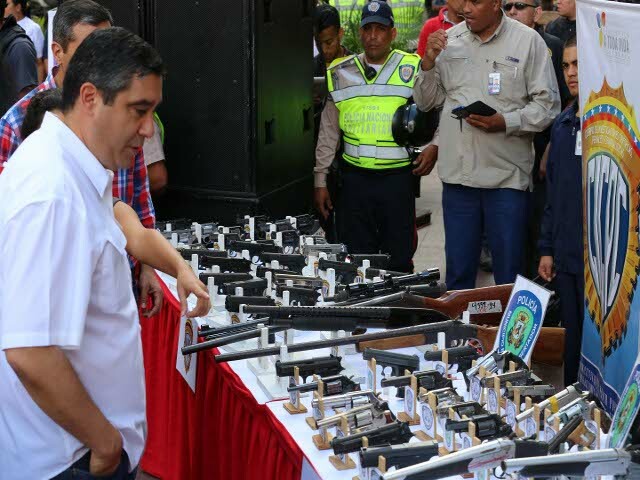 Meanwhile, other legal guns just fell in the wrong hands: Three men robbed 54 weapons from a Bolivarian National Police branch in Guarenas, Miranda State. Weeks ago, a similar incident occurred inside a Maracay military base.